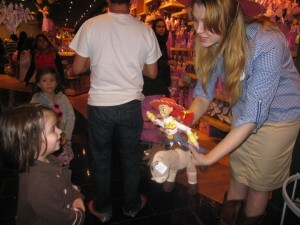 It wouldn’t be a Disney store without some hands-on, interactive entertainment. Most of this is on the upper floor, where the merchandise is segmented by movie or television show. A wall of purple greeted us at the top of the elevator; everything you could ever want from Tangled. 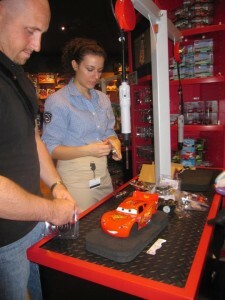 On the left is the Cars merchandise, with a build-your-own car station called RideMakerz. I wanted to make the “Stealth Mater,” but I resisted. Medicated or not, I wasn’t so foolish as to wait on the cashier line, 25-people deep. Further back is a miniature, crawl-through Playhouse Disney with a video screen in the ceiling. The Girl squeezed her way in, and was quickly squeezed out by – possibly, seemingly –a throng of 2,000 other toddlers and pre-schoolers with a life of its own. Who's the fairest one of all? Well, that should be obvious! Of course, there’s a castle, a giant pearl façade glimmering under the light of an immense crystal chandelier. 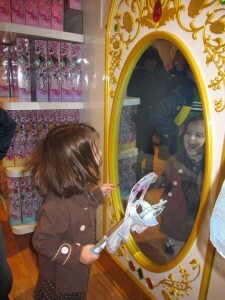 This was where we found the magic mirror, the highlight of The Girl’s day. It’s cool technology; you wave the Ariel wand in front of it, and a Little Mermaid video clip comes on screen. The Girl gravitated toward Cinderella. I’m gonna give her a while longer before I put a smack down on the Prince Charming propaganda. For The Boy, who is ten, there wasn’t a lot to interest him, except for the Tron display and the Phineas and Ferb products. But they both enjoyed Imagination Theater, where a large arts & crafts table was covered with coloring supplies, and an even larger video screen played snippets from Disney movies and TV shows. 8. You can find nearly anything you need here for the Disney fan in your life. I know the true Disney fans have read this whole post and have patiently reached this giveaway! It’s SO worth it! 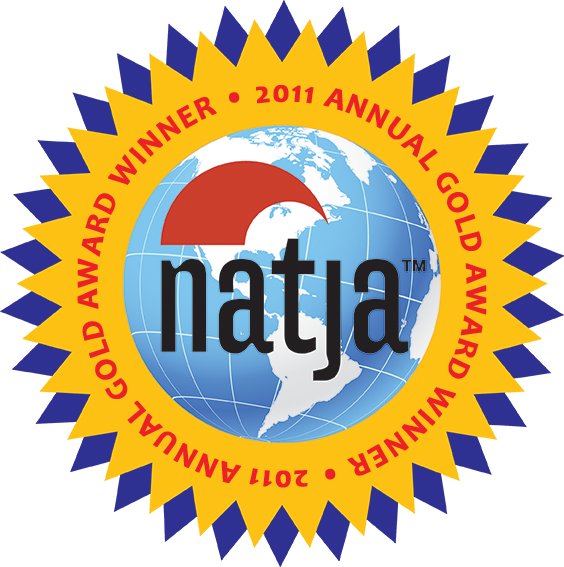 We’re giving away a copy of Walt Disney World Extreme Vacation Guide for Kids by Kathleen Reilly. When kids find out they’re going to Walt Disney World, they’re psyched. This book is packed with more than 30 fun projects to extend the excitement, like making matching T-shirts, autograph books, a Mickey piňata, and even behind-the-magic projects like a wave tank to explore the science of Typhoon Lagoon. And when kids come home and struggle with “re-entry” into everyday life, there are 10 projects to share their memories. It’s perfect for kids 6-14, but there are also over a dozen “Minnie Projects” for kids under 6. There’s also a chapter on Disney-themed travel activities to keep them busy during the trip, and of course, there are tour guide chapters devoted to each of the four parks. Want to enter? Just sign up to receive our e-mail notifications (see upper right hand corner). If you’re already a subscriber, just comment below and give me the name of an obscure Disney character (e.g. Lady Cluck from Robin Hood). A winner will be chosen randomly from the names of new e-mail subscribers to this site and those who comment. A winner will be notified next Thursday (12/9/10), and will be asked to provide a mailing address. The prize will be mailed directly to them from the author, so the winner must reside in the U.S.
Matt didn't care what was showing in the Imagination Theater; he saw the opportunity to SIT, and he took it! This is great – we have all the old Disney movies on VHS tape! My contribution – Roquefort the mouse from the Aristocats. 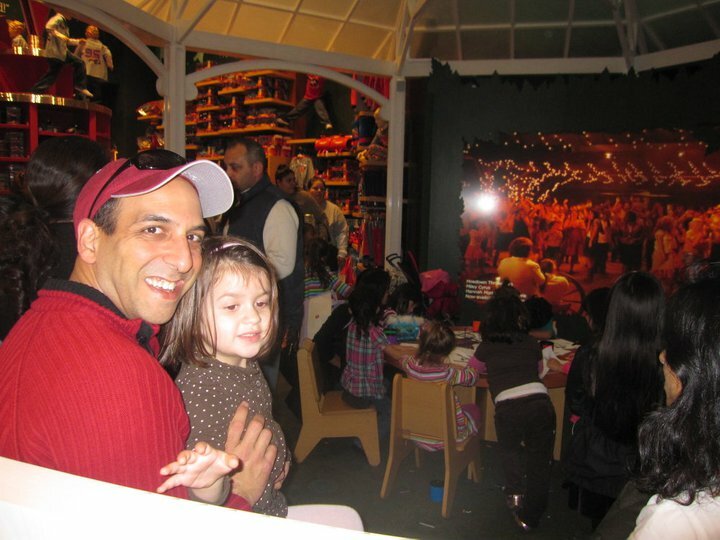 Every child’s dream…..Toyland in one store. Might put Santa out of business. Thanks for sharing! FUN!!!!! Really want to go over the next few weeks! I went to the “World of Disney” in Orlando over the summer on our trip to Disney, and I can’t imagine any place with as much or more Disney paraphernalia in one place! Looking forward to visiting the store in NYC this season to see how it compares! Love reading your posts. I like King Louie from Jungle Book. Maybe not all that obscure…but he cracks me up nonetheless. We missed this store when we visit NYC over the summer granted we only had less than 24 hours there. 🙂 Gonna have to put that on my next trip. I just subscribed to your blog via email. 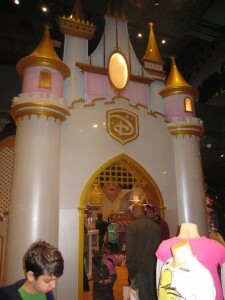 I love the NYC Disney Store on 5th Avenue, this one must be the new one in Times Square. I hope to make it to the New York store one day. I love the World of Disney at Downtown Disney! I’m a Disney vacation planner so obviously I’m all about Disney-anything!